This train is now nearly at full capacity. We do have a limited number of single seats available. Please contact our office on 07 3252 1759 to book! 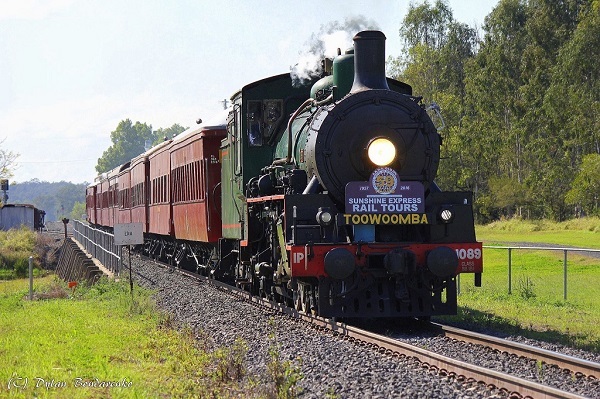 The Society will be running two steam train excursions to Toowoomba for the Carnival of Flowers. This tour will run on ** Saturday 22nd September 2018 **. The trains will take us all the way to Toowoomba. The route includes the crossing of the Little Liverpool Range, the fast run across the black-soil plains of the Lockyer Valley and the steep climb of the Main Range. Mid-way up the range the trains will slow as we pass through the station at Spring Bluff which is normally a delight at this time of the year. Lunch will be available at “Inbound” (the former railway refreshment rooms situated on the station platform) if preordered with your tickets. This will be a two-course meal consisting of roasted chicken and vegetables with mash and dessert of trifle with dark chocolate brownie, fruits and cream at $30.00 a head, immediately on arrival of the train. If you would like lunch please include this on the booking form. 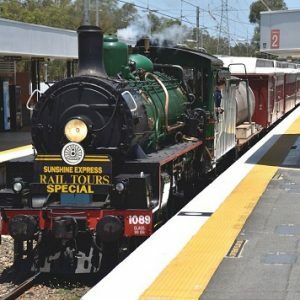 After lunch, coaches will take passengers on a tour of the wonderful gardens and thence to Helidon Railway Station to re-join the train for the trip back to Brisbane. The refreshment car will be open for sustenance on the way home. 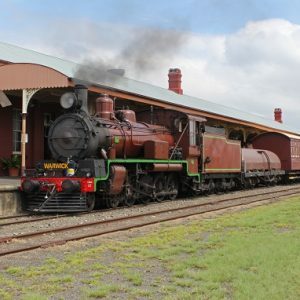 DOWN THE RANGE (Both days) Passengers who would prefer not to do the gardens tour may travel from Toowoomba to Helidon by train on payment of an additional $40.00 per Adult & $20.00 per Child. THE TRAIN: Subject to availability, BB18¼ locomotive No. 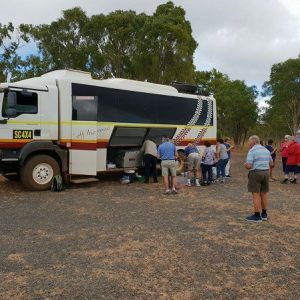 1079 should work the tour assisted on Saturday by a diesel engine from Helidon to Toowoomba. The train will consist of wooden carriages from QR’s heritage fleet. JUNIOR RAIL FANS’ CLUB: Any JRFC member accompanied by an adult may travel free. SMOKING: Queensland Rail has a policy of “NO SMOKING” on board all trains and at all railway stations. In accordance with this policy, smoking is not permitted on tour trains and passengers are advised to observe any areas in which smoking is prohibited at stations. REFRESHMENTS: Light refreshments (sausage rolls, pies, sandwiches etc. ), hot and cool drinks, chips & sweets will be for sale on the train. 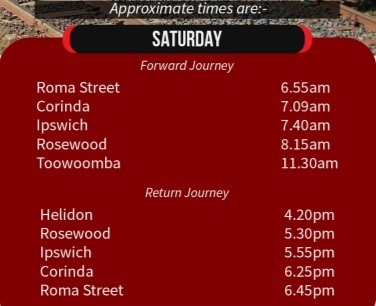 Venue: Departs Roma Street at 6:55am (Brisbane -> Toowoomba), otherwise if you are on the Toowoomba -> Helidon Tour then the train departs Toowoomba at 2:15pm. from Tuesday->Thursday from 10am to 3pm.